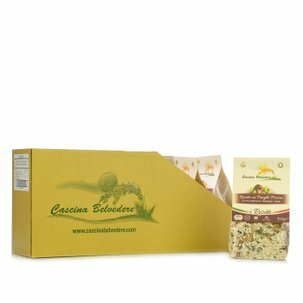 The lemon risotto is a natural product made without preservatives and without additives. It is perfect for the wonderful months of summer: it has the fragrances of the Mediterranean, of freshness and lets you serve an unexpected, delicate and elegant risotto. You can prepare in the classic manner using a frying pan, with some sautéed onions, or in the microwave by simply adding some water. When cooked, mix some butter and parmigiano into the lemon risotto, adding some salt ...and well-being is served in your plate! Ingredients carnaroli rice 91%, lemon 3%, natural sea salt, rice flour, onion, celery, carrot, parsley, extra virgin olive oil, garlic, maize starch, apricots, miso (soya, rice, water, salt, koji), glucose syrup, yeast extract, spices. For more information on product labels, please contact our Customer Service department. The information on the labels of the products may vary for reasons beyond our control, therefore, there may be discrepancies between the information on the site and that on the products delivered. Please always check the information on the product before consumption or use.